Plastersure plaster additive, is an anti-efflorescence product - Plastersure stops bubbling and flaking of paint in its tracks. 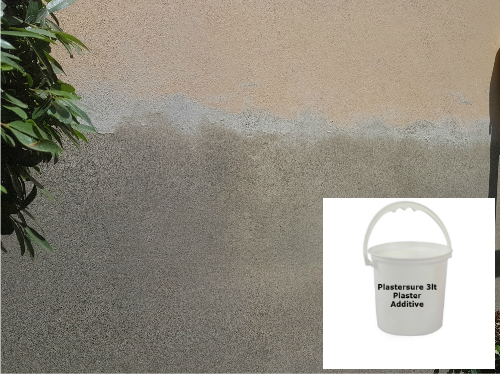 Plastersure plaster additive can be used in walls like boundary, balcony, plinth sections and rising damp walls. Plastersure plaster additive provides long term aesthetically pleasing plaster finishes. 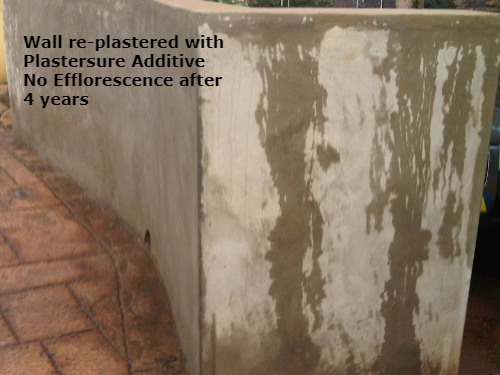 Plastersure is a concentrated efflorescence, anti paint bubbling and anti paint flaking product. This concentrate contains a mixture of latex and alkaline fatty acids, designed for use in plaster/render mixes. Re-Plaster normally will be done after the insertion of chemical DPC cream into the wall and tanking the wall against future damp problems with Dampcrete47. Re-plastering with Plastersure can be done in a wall suffering from rising damp and to stop salts migrating in water vapour to the surface of the wall. As the wall dries out following insertion of a chemical damp-proof course, the evaporating retained moisture inside the wall will result in salts being deposited on or near the surface of the wall and can give rise to efflorescence. Damp patches may also develop when the ambient humidity is high, due to Salts that are hygroscopic. A suitable re-plastering protocol is required following the insertion of a chemical damp-proof course. Plastersure is a vapour permeable re-plastering additive, designed to minimise the passage of liquid water through the pore structure of cement plasters, thereby preventing the transfer of salts to the surface. Re-plastering should be carried out as long as possible after the insertion of a remedial damp-proof course. Ideally the new plaster should be applied to walls treated with Dampcrete47. Chip damaged plaster from walls. Chipped walls and masonry joints should be raked out and all surfaces thoroughly cleaned to remove dust or other loose brittle material. All trace of previous plaster must be removed. Any organic matter (including timber fixings) must be removed and, where appropriate, fixing point which necessitate cutting into the background prepared. Plaster can not stick to brittle surfaces, all brittle and sandy surfaces needs to be treated as to provide a sound surface for plaster to stick to. Chipped walls and masonry joints should be raked out and all surfaces thoroughly brush cleaned to remove dust or other loose brittle material. All brittle and high suction surfaces/areas should be thoroughly re-glued using Dampsure GlueBack. 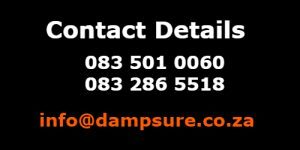 For advice concerning waterproofing in these situations or if doubt exists as to the extent or nature of the salt contamination the Dampsure Technical Department should be consulted. The plaster should be applied to a thickness of 10-12mm. The surface should be brush plastered before applying the next plaster coat. Apply Dampsure Bonding Liquid to the wall to provide a key for the plaster. 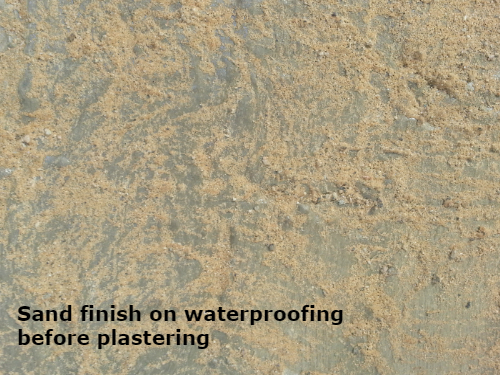 wetted with diluted Plastersure must be used for plastering of the wall. Mix or make a minimum of 4 drums x 25 liter Plastersure diluted plaster additive mixture for one batch of plaster. The diluted Plastersure mixture is the only liquid to be used to plasticize the plaster. Warning – At no stage must any water be added directly to the plaster mix. No more than two plaster coats should be applied in one continuous working process. If greater thicknesses are required the first coats should be scratched and left to cure prior to applying Dampsure Bonding Liquid before proceeding, the sand/cement undercoats should be scrape finished and mist sprayed for the first 48 hours to reduce the risk of shrinkage and cracking. Initial decoration should be delayed as long as possible and should not be applied within 14 to 21 days of the finish coat plaster coat. Final decorations which reduce permeability, such as papers and oil paints, should not be applied until the walls have dried out, with at least 12 months being allowed following temporary decoration (for typical 225mm brickwork walls). The temporary decoration should be limited to a vapour permeable finish such as a breathable paint. Drying times for thicker walls may extend to several years and will depend in part on the level of winter time heating etc. If impermeable decorative finishes are to be applied in such situations an alternative approach to re-instatement involving the use of vapour impermeable ‘air-gap’ membranes may be considered.